Why, yes. I have accomplished the impossible. Burning hummus is no easy feat, I assure you. It involves the chickpeas engaging in an overnight soak, a long, sensual boil in what I thought was a generous serving of water, a steam break while I attended class and, finally, a final boil that resulted in the water abandoning my chickpeas in their last hour and allowing them to wreak havoc on my favorite pot. Admittedly, the negligent water is not the only guilty party. I might not have watched the pot as closely as necessary, eschewing my kitchen duty in favor of homework and a long phone conversation. Frankly, I have no idea what sort of canned food battle Orwell envisioned when he said that (I can’t help but imagine troops of canned diced tomatoes armed with machine guns), but the man said so many other profound things that I’ve decided to humor him in this particular instance. At this point, I’m simply looking to rectify the situation. I have more dried chickpeas, a back-up pot and enough patience to try this one more time. Now can someone please tell me how to make hummus with less disastrous results? This entry was posted in kitchen catastrophe. Bookmark the permalink. Cooking the beans in a pressure cooker is quick and easy, that’s how I usually do it. A stainless steel pan that has had an unfortunate experience can be polished up nicely with “Barkeepers Friend”, a fine grain sanding sponge, and a little elbow grease. Apologies to Mr. Orwell, but I use canned chickpeas. I rinse them well to get as much of the canning liquid and salt off as possible. Then, it’s toss in the food processor with the other stuff. You’re still saving money over buying hummus and – even better – you get to put as much of what you like in it. If you still have a bunch of the dried ones. Joy of Cooking says just to simmer for 1 1/2 to 2 hours – doesn’t mention soaking. 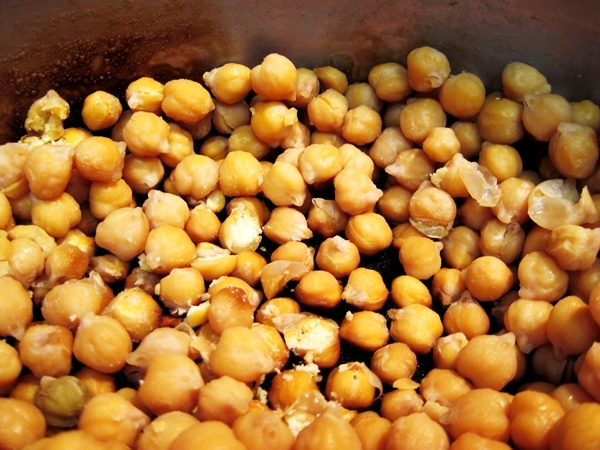 Another chickpea recipe I like: I cook some garlic in olive oil in a frying pay, toss in the drained chickpeas and a teaspoon or two of chopped fresh rosemary, and stir and cook until the chickpeas get a little browned. Salt and pepper, and you have a sort of chickpea popcorn. I use dried beans on a regular basis. the best, most timely/convenient and safest way is to quick soak – place in a pot covered with a 1/2 tsp-1 tsp of baking soda. cover with water two inches over the beans. bring to a boil. boil 1-2 minutes. turn off heat. let sit for one hour in the hot water. drain and rinse (helps reduce the gas when you eat them later). put back in pot with water two-three inches over the beans. Cook until softened, about 45 minutes. you can cook the beans with a clove or two of of garlic, a bay leaf, epazote leaves for flavor. do not add salt until the last 2 minutes of cooking. this will help the beans retain their shape. note, if you add salt too early, the beans will take much longer to soften. same applies to tomato bases and dried beans. because of the acid in tomatoes, beans take about 4 times longer to soften when tomatoes are added too early. Thanks so much! I’m saving this advice.